I missed blogging last week. I am ready with my excuse - I was in Hyderabad on office work. I was put up in a hotel for an entire week and had to eat all my meals there. 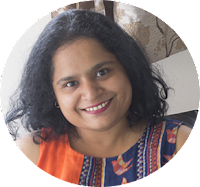 Hyderabad is definitely the chilli and I also think spice capital of India. I had my eyes watering and complaining that the food is too hot, while the Hyderabadis were surprised at my low spice tolerance. And I thought I ate spicy food!!! By the time I returned home, all I wanted were the boring simple home food. Some cabbage or beans, may be? I was like that for a week. Finally as the weekend neared, I dared to go near some of the SPICES when I found these lovely TINDA in the market. 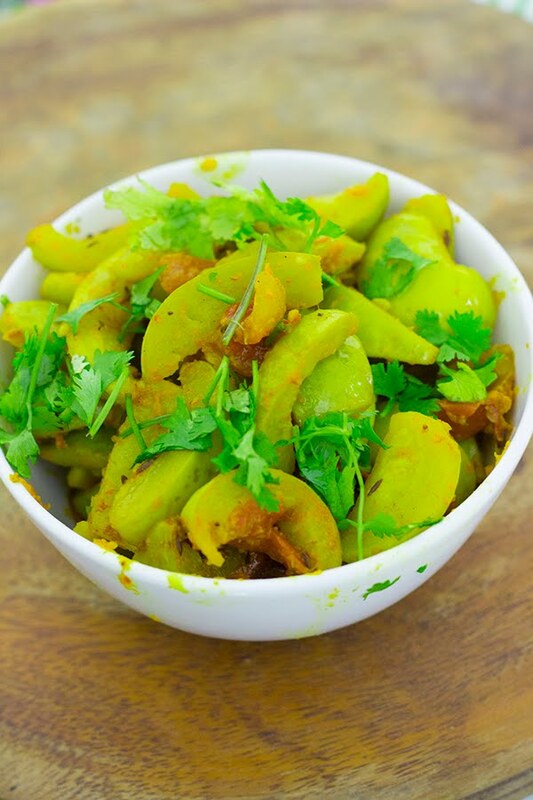 Tinda is known as apple gourd. It is native to the Indian sub continent. It resembles a guava or a green apple but is neither sweet nor does it have the texture of either of the 2 fruits. The closest in taste and texture is the bottlegourd or the lauki. 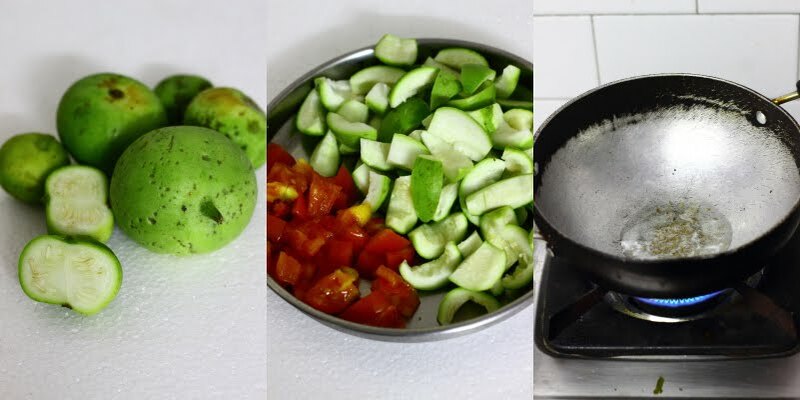 It is basically a vegetable with a very mild taste and it tends to take on the flavour of what it is cooked with. I've added spices to the Tinda Masala , but in very little quantity. 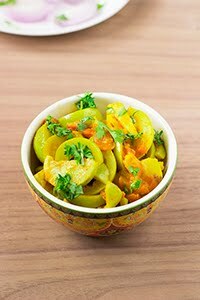 1) Chop the Tinda into chunks and chop the tomatoes roughtly. 2) Heat oil in a kadhai / pan and add the cumin seeds. 3) Once the cumin seeds brown, add finely chopped tomato and fry for 1-2 minutes until the tomatoes soften. 4) Now add the Tinda and cover and cook on low heat. Add a little water if you feel the tinda will stick to the bottom of the pan. 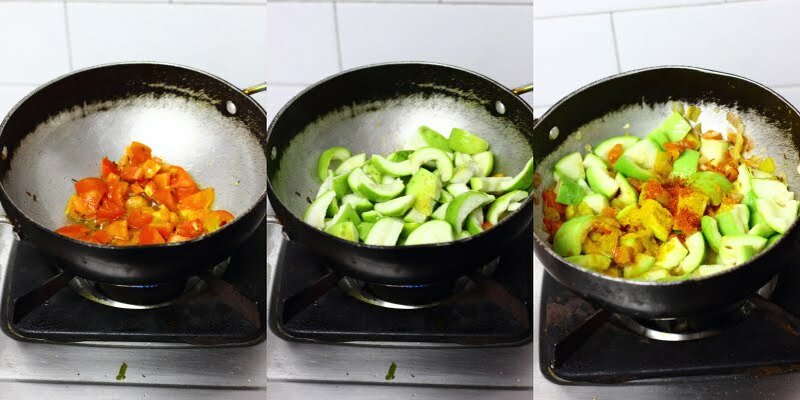 5) When the tinda is almost done, add all the spices and salt. Cover and cook until the tinda is cooked through. 6) Garnish with freshly chopped coriander leaves and serve with rotis. 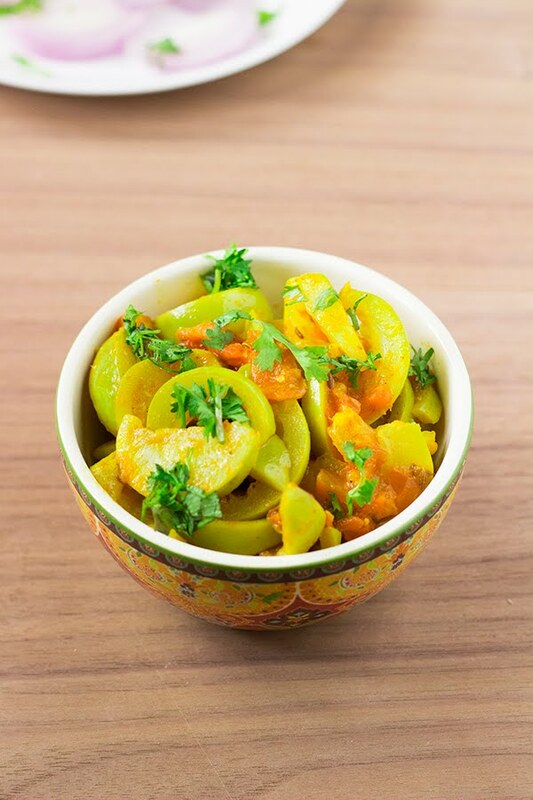 Tinda Masala is a dry curry made using tinda or apple gourd, tomatoes and spices. Vegan and Gluten Free. You can peel them or leave it as is. Remove the seedy pulp if the seeds are too large, else, you can let it be. Then, dice the Tinda into big chunks. Heat oil in a kadhai / pan and add the cumin seeds. Once the cumin seeds brown, add finely chopped tomato and fry for 1-2 minutes until the tomatoes soften. Now add the Tinda and cover and cook on low heat. Add a little water if you feel the tinda will stick to the bottom of the pan. When the tinda is almost done, add all the spices and salt. Cover and cook until the tinda is cooked through. Garnish with freshly chopped coriander leaves and serve with rotis.